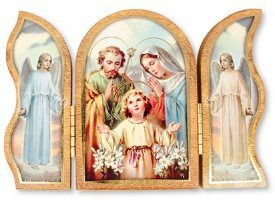 Catholic Wall Plaques including Holy Family, Saint, Divine Mercy and other religious wall plaques. Wood Plaque Triptych Divine Mercy. Christ Teaching Wall Plaque with Gold Foil. Virgin Mary with Baby Jesus wall Plaque Gold Foil. Holy Family Wall Plaque with Gold Foil. Gold Foil Christ Teaching Wall Plaque. Lourdes Laser Cut Wall Plaque with Prayer. Divine Mercy Laser Cut Wood Plaque. Our Lady of Grace Wall Plaque with Wall Hook. Laminate Pope Francis Wall Plaque. An Irish Prayer Wooden Plaque with Stand. Serenity Prayer Wood Wall Cross.